Bring along your completed embroidery to prepare it professionally to a conservation standard, ready for mounting or framing. Pick up top tips for displaying your treasured embroidery. For instance, we’ll have some examples to show you. We use conservation quality acid-free materials which are provided as part of the workshop kit. Your finished embroidery needs to be no larger than about 25cm (10 inch) within a 33cm (13 inch) square of fabric. Of course your fabric and completed embroidery can be smaller than this if you wish. If you have completed any of the Quaker Tapestry embroidery kits, or any of our workshop kits, they would be perfect for this workshop. The Conservation Materials Kit includes: acid-free foam board, cotton Bump, cotton calico, acid-free textile book tape, PVA conservation glue, T-Pins, Bonded Nylon Thread and sewing needle. Equipment – and tools are available to use during the workshop. Refreshments – hot drinks and biscuits are ‘on-tap’ throughout the session and lunch is available to buy from our on-site Cafe. 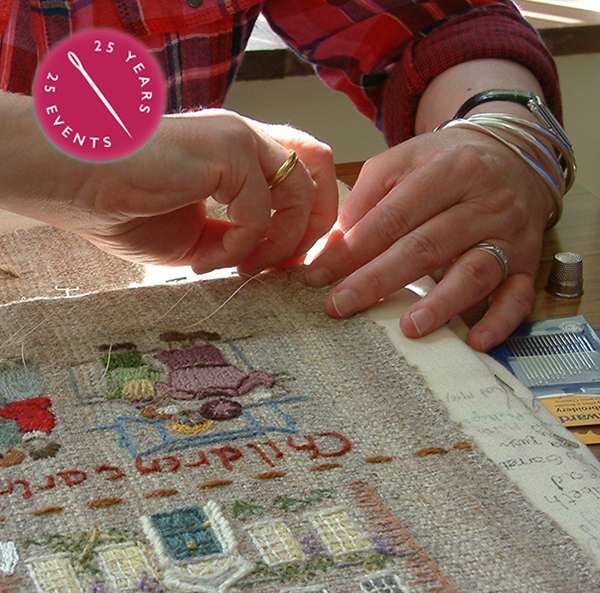 FREE entry – to the Quaker Tapestry Museum for all attendees on the day of the workshop.